Have you ever wondered what goes into those $4 Kombucha bottles you buy at the store? Or thought to yourself why is this stuff so expensive? Or maybe you’ve only heard people talking about it, and never tried it for yourself. Maybe you’re curious, “What is Kombucha? And why should I care?” I am here to put all of those questions to rest, friends! I have been brewing homemade Kombucha or a little over a year, and I am here to tell you – save your money and join me! All you need is a little time (21-ish days to be not-so exact), and a few simple ingredients and BAM you’ve got yourself some homemade gut-healing goodness. DISCLAIMER: If you have an aversion to gross stuff and would rather live in ignorant bliss about all that gook you’ve seen floating around in your store-bought Kombucha, stop reading here. I take no responsibility if this post ruins Kombucha for you forever because you didn’t realize you were drinking bacteria and yeast sludge. Whoops. Okay, well, hopefully you’ll keep reading anyway! Put simply, Kombucha is fermented tea. The liquid is a strong tea and sugar. When a SCOBY (acronym standing for symbiotic culture of bacteria and yeast) is added, the bacteria and yeast feed and multiply on the sugar in the tea. The result is a tangy, slightly vinegary drink full of immune-boosting, gut-friendly little bugs! And an added bonus, those little buggies eat most of the sugar in the drink, so you’re left with something slightly-sweet, but fairly low in sugar. Think of a SCOBY as a mushroom. It more resembles a flab of fat. Or uncooked chicken. Sorry, this is where it gets gross – hence the face in my photo! The SCOBY is itself the bacteria and yeast culture that is feeding on the sugar in the tea. When you add a SCOBY (the mother) to the tea , it actually starts to grow a baby. Congratulations, it’s a girl! Just kidding. But the, “Mother,” does make a, “Baby,” every time you brew a batch of homemade Kombucha. The, “Mother,” and, “Baby,” have to be separated when you bottle your Kombucha, leaving you with not one, but two SCOBYS now. This is when you can share the homemade Kombucha love with a friend. Sharing is caring, after all! Why all of the hype? Kombucha, like a lot of fermented foods, has been made and consumed for hundreds of years. Depending on who you ask, the Russians and the Chinese take credit for creating this magic elixir. The benefits are like any other fermented food – “good” bacteria that help create an ironclad microbiome. Your body’s bacteria are responsible for many functions, not the least of which is keeping you healthy. By consuming beneficial bacteria, like those found in Kombucha and other fermented foods, you are giving your microbiome a boost of healthy bacteria to keep it strong and healthy, which in turn keeps YOU strong and healthy. You can either order one online and rehydrate it (never done it), or find a friend that is crazy like you and already brewing homemade Kombucha (this is the route that I took). When you ask around, I bet you’d be amazed at how many people are brewing homemade Kombucha. One of my best friends, Jennifer Dornbush (I am using her full name because she is a writer, and a darn good one at that, so hopefully you’ll go look her up), gave me a SCOBY and I have been using it and its babies ever since. Do I need to be worried about drinking homemade bacteria? Not really. People have been brewing Kombucha for a long time. Furthermore, the brew itself is actually acidic, and therefore unlikely to allow for the growth of bad bacteria. The only time you need to worry is if your SCOBY turns a bizarre color, starts to smell, or starts growing mold. These can all be signs that your SCOBY has been taken over by bad bacteria. I have never had any of these things happen to me, but if you do experience any of them, discard your entire batch, including the SCOBY, and start over. I am by no means an expert, or claim any kind of health authority, so if you are concerned, be sure to do your own research and consult your doctor. Brewing Kombucha at home is relatively easy once you have a SCOBY. Your SCOBY and starter kombucha need to be at room temperature before combining everything. Leave them on the counter as you prepare the tea mixture. In your large 1-gallon glass jar, add the hot water and cup of sugar and stir until dissolved. Add the tea bags and steep for 20-30 minutes. Carefully remove the tea bags from the mixture and discard. Allow the tea to cool to room temperature before proceeding. Add the kombucha, as well as the SCOBY to the brewed tea. Cover the jar with your tight-weave cloth, and secure with a rubber band. Store the mixture at room temperature (68°-85°) out of direct sunlight (I use the cupboard above my microwave) for 10-20 days, or to taste. The longer the mixture ferments, the less sweet and more it will taste like vinegar. This is the fun part! You’ve made it past the waiting period and now you get to flavor and taste it! It should be noted, that you don’t have to flavor it if you don’t want to. A lot of people drink it plain. If you want to sweeten it a little bit more, or if you want to add more flavor, keep reading! Pomegranate juice – my personal favorite! 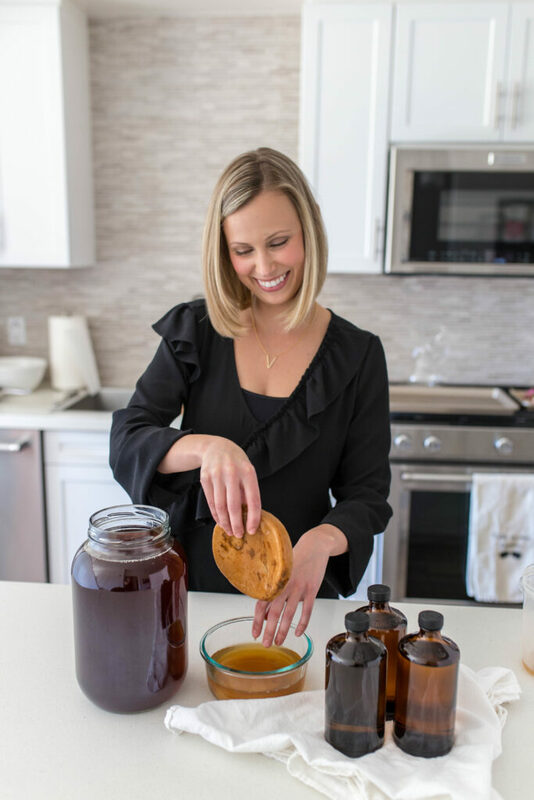 Keep the two SCOBYs – separate the top (Mother) from the bottom (Baby) and retain enough liquid from the bottom of the jar to use as starter kombucha for the next batch. See SCOBY “hotel” below for more information. Pour or ladle kombucha into individual bottles, leaving enough room to add flavoring (if desired), and an extra inch of room at the top. Add the desired flavoring to each bottle and secure lid. You can either refrigerate your flavored kombucha, or do a second ferment at room temperature for 2-14 days. Kombucha that is fermented twice will have a more complex flavor. During the fermentation process the bacteria and yeast give off gas. The more sugar in your flavoring, the faster it ferments. Think of sugar as food for the bacteria and yeast. As a result, it is a good idea to “burp” the bottles during the second ferment, especially if longer than 2 days, to release the excess gas and pressure. Use caution when opening bottles. To store your brew, simply place it in the refrigerator. It is best consumed within 1-2 weeks. Even though it is in the refrigerator, it will still continue to turn to vinegar. The longer you let it sit, the stronger the vinegar flavor. Now that you’ve completed an entire brew, you should now have two SCOBYs – the original, “Mother,” and the new, “Baby.” Make sure you keep enough of your brew to allow your SCOBYs to be completely submerged. 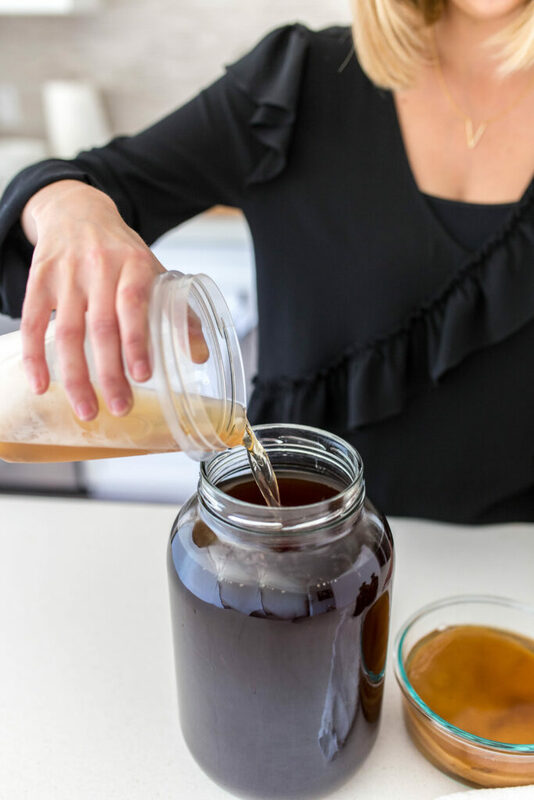 When you’re ready to make a new batch, simply take out one SCOBY, and enough of the liquid as the starter Kombucha, and leave at room temperature while you prepare your tea. As you can imagine, after a few batches, your hotel will start to get really full. I started giving SCOBYs away to brave friends, and eventually I kept what I deemed to be the healthiest SCOBYs and threw away the rest. These are the websites where I have found a lot of my information. They are great resources for troubleshooting, ideas, and any Kombucha or SCOBY questions you may have. A Thousand Crumbs participates in the Amazon Services LLC Associates Program, an affiliate advertising program designed to provide a means for me to earn fees by linking to Amazon.com and affiliated sites. 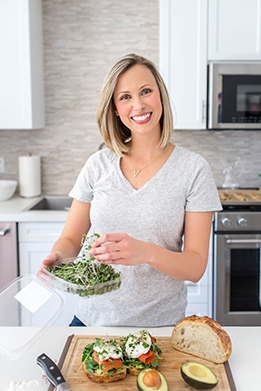 Links like these help me operate the blog and keep tasty recipes at your fingertips! All links are for products I personally stand behind or use. I will never endorse a product I wouldn’t use or purchase myself. Thank you for your support!